The gods and demons were always fighting. But every time the demons were killed, their guru, Shukracharya, would bring them back to life by the secret of mritasanjibani. The gods also wanted to learn the secret so they sent Kacha, the handsome son of their guru, Brihaspati, to Shukracharya's ashram. Kach fell in love with Devyani, Shukracharya's daughter. When the demons found out that the gods had sent Kacha, they killed him. 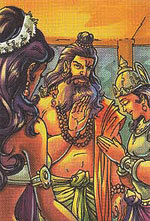 They mixed his remains with the wine that Shukracharya drank. When Devyani came to know that Kacha was dead, she begged her father to bring him back to lif. But if Shukracharya brought Kacha out of his stomach, he himself would die. So he taught Kacha the secret of mritasanjibani . Shukracharya brought kacha back to life and he died. Then, Kacha brought Shukracharya back to life. In this way, the lives of both were saved . Kacha went back to heaven and taught the secret of mritasanjibani to the gods.